An artist's concept of the Ulysses spacecraft. After more than 18 years of dedicated service, the solarorbiter Ulysses is due to end its tenure Jun 30. The joint ESA/NASA spacecraft will finally switch off its transmitter,after defying several earlier expectations of its demise. 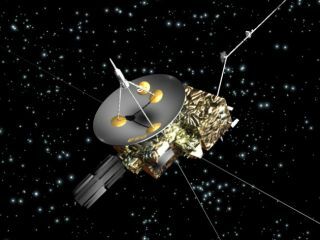 Ulysses is thefirst spacecraft to survey the environment in space above and below thepoles of the Sun ? ?in the four dimensions of space and time. Among a number of ground-breaking results, the missionshowed that theSun?s magnetic field is carried into the Solar System in a more complicatedmanner than previously believed. Particles expelledby the Sun from low latitudes can climb up to high latitudes and viceversa, even unexpectedly finding their way down to planets. This means that regions of the Sun not previously consideredas possible sources ofhazardous particles for astronauts and satellites must now be taken intoaccount and carefully monitored. "Ulysses has taughtus far more than we ever expected about the Sun and the way it interactswith the space surrounding it," said Richard Marsden, ESA?s UlyssesProject Scientist and Mission Manager. The shut-down of the satellite is ajoint decision of the two agencies and comes a year after the mission wasexpected to end. A year ago, the satellite?s power supply had weakened to thepoint that it was thought the low temperatures would cause the fuel lines tofreeze up, rendering Ulysses uncontrollable. This didn?t happen immediately andspacecraft controllers realized that they could keep the fuel warm andcirculating by performing a short thruster burn every two hours. But as Ulysses has moved further from Earth, the communicationsbit-rate has gone down, and the mission managers decided they could no longer justifythe cost of keeping Ulysses in operation. "We expected the spacecraft to cease functioning muchearlier," said Paolo Ferri, Head of the Spacecraft Operations Solar andPlanetary Missions Division. "Its longevity is a tribute to Ulysses?sbuilders and the people involved in operations over the years. Although it isalways hard to take the decision to terminate a mission, we have to accept thatthe satellite is running out of resources and a controlled switch-off is thebest ending." After shut-off, Ulysses will continue to orbit the Sun,becoming in effect a man-made ?comet?. "Whenever any of us look up in the years to come,Ulysses will be there, silently orbiting our star, which it studied sosuccessfully during its long and active life," said Marsden.